For the chimichurri: combine all ingredients in a food processor or blender. Process, scraping down the sides occasionally until smooth, about 2-3 minutes. Take out a ¼ cup for marinating the steak and place the rest in an airtight container in the refrigerator. 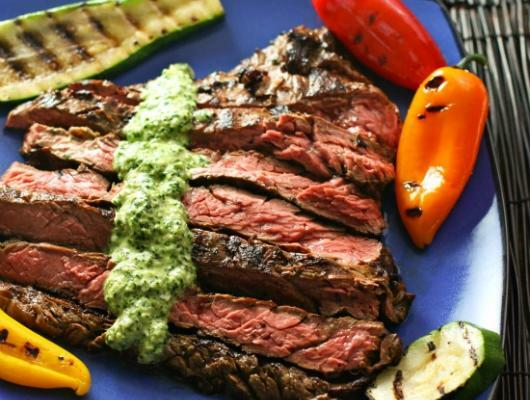 For the steak marinade: in a small bowl, combine the soy sauce and ¼ cup Chimichurri sauce until well blended. Sprinkle the steak with salt and pepper and place in a resealable plastic bag (cut steak in half crosswise to fit, if necessary). Pour in the marinate mixture, seal the bag and marinate at room temperature for 1 hour. Heat BBQ or heavy based skillet over high heat until smoking. Remove the steak from the marinade and place on the grill. Cook for 2-3 minutes on each side (use meat thermometer to reach 132°F for medium rare or until cooked to your taste). Transfer to a plate, cover loosely with foil and rest for 7-10 minutes. Cut thin slices against the grain and serve with remaining Chimichurri Sauce on the side. 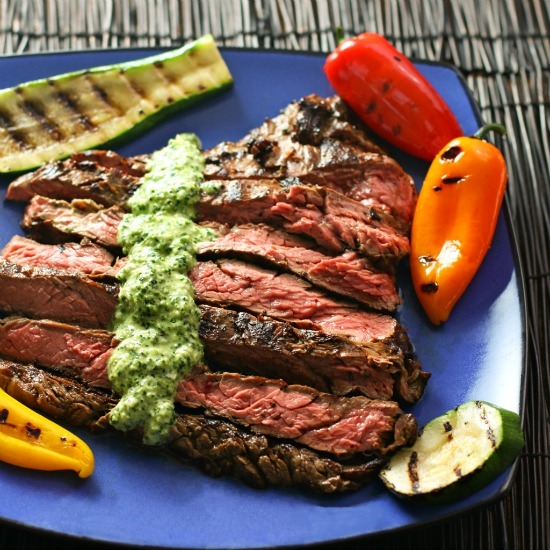 Super tender, delicious and affordable Skirt Steak with CREAMY Parmesan Chimichurri Sauce is the perfect summer meal! Get ready to impress your guests with this quick & easy #beef #dinner!